Botanik Natural Deodorant is probably the most positively received deodorant we have reviewed. It has nearly 80% of the reviews being positive. However, it seems like not many people are aware of it yet as there have only been 28 reviews. So let's see if this deodorant is worth promoting. Botanik Natural Deodorant is like all of the others we have featured here, a stick design deodorant. This is a very popular choice among the masses as it is what the commercial brands are designed as. Most people are more than used to the stick deodorant so this is obviously the most popular choice for people just getting into the natural deodorant game. Plus it is pretty much the best overall choice, as it both deodorizes and absorbs sweat well. Many natural stick deodorants are usually made up of a form of natural oil or butter, like shea butter, along with baking soda, or one of the other natural absorbents, and essential oils for the fragrance. In fact, there are several essential oils that are antibacterial by nature, like tea tree oil or neem oil. When it comes to the ingredients inside Botanik Natural Deodorant, you start to see why people love this product so much. This natural deodorant is only made with 9 ingredients, 8 of which are certified organic. The complete list of ingredients in Botanik Natural Deodorant are as follows: Cocos Nucifera (Coconut) Oil *, Copernicia Cerifera (Carnauba) Wax*, Maranta Arundinacea (Arrowroot) Powder*, Butyrospermum Parkii (Shea) Butter *, Sodium Bicarbonate (Baking Soda), Pseudotsuga Menziesii (Douglas Fir Essential Oil)*, Pinus Sylvestris (Scotch Pine Essential Oil)*, Salvia officinalis (Sage Essential Oil)*, Eucalyptus Citriodora (Eucalyptus Lemon Essential Oil)*. There is no doubt that this stuff is good at keeping sweat at bay. It makes use of both Arrowroot Powder and Baking Soda for their absorbent properties. However, there is a common issue with baking soda. It is a common ingredient that some people are highly sensitive to, or even have an allergy to. So before you use this product, be sure you have no sensitivity to Baking Soda, otherwise it may result in a rash. Past that, everything in this deodorant is organic, natural, and have multiple health benefits for you to take advantage of. Speaking about benefits, this deodorant is loaded! Like I said above, 8 of the 9 ingredients are USDA Certified Organic. In addition, this deodorant is free of aluminum, synthetic ingredients, parabens, GMOs, and toxins. 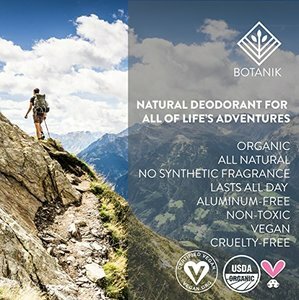 For those living a vegan lifestyle, you can add Botanik Natural Deodorant to your allowed products to use, as it is certified Vegan, cruelty free, and gluten free. On top of that, this stuff actually works. Of course, there will always be some people who it will not work for them because everyone is different. But just by looking at the ingredients, it seems to very easily control your sweat, and with the essential oils included, it will smell great. Botanik was started by two friends, Jenna and Kylie, who wanted to curate the highest quality natural products all made from ingredients that are found in nature. On all of their products, they feature their ingredients both on the front of the label and on the back, they believe in complete transparency. All of their ingredients are extracted from roots, trees, sap, pulp, twigs, and other natural sources. Their flagship product only features 5 ingredients and is completely free of aluminum. They are still a seemingly new company so their product line is long, but what they do have is great. They have 3 different natural deodorants available to the public, which they sell mainly on Amazon or their website. They have a wild lavender scent, fresh evergreen, and unscented for sensitive skin. All of which are made from the same 5 ingredients. Coconut Oil, Carnauba Wax, Arrowroot Powder, Shae Butter, and Baking Soda. The only thing that changes are the essential oils. Botanik Natural Deodorant is designed in such a way that makes it comfortable for new comers to easily switch from commercial brands to natural. Stick deodorants are what most people are already used to, so it is great to see this natural brand use the same. This natural deodorant, and all of Botanik Natural Deodorant options, are made from the same 5 base ingredients, all of which are also USDA certified organic. The only ingredients that change are the ones that make the scent of the deodorant. If you are either vegan or gluten free, this may be the ideal product for you. Botanik Natural Deodorant is both certified vegan and gluten free. In addition, it is also cruelty free, which means it was never tested on animals. In terms of what this deodorant does not include, it does a great job of making sure that there is nothing bad in this deodorant. This natural deodorant is free of any form of aluminum, parabens, synthetic fragrance, GMOs, artificial ingredients, and toxins. This stuff actually works very well, according to the bulk of customers who left reviews. Baking Soda and Arrowroot Powder make for incredible wetness control. Every ingredient has a specific purpose, whether it be controlling your sweat, eliminating your odor, or making you smell great and fresh. While the deodorant does claim that it is safe for sensitive skin, there is baking soda included here. This is an ingredient that can cause skin irritation or a rash to someone who is sensitive to it, or allergic. For most people, it will have no negative effect. However, it is best to check with your doctor before using, to avoid any unwanted irritation. Basically as long as you are not sensitive to baking soda, you should not have a problem with this natural deodorant. In fact, of all the negative reviews, I did not see one that complained about a rash. All of the negative reviews revolved around the product simply not working well for them. However, every body is different, so of course it is normal for a product not to work the same for everyone. However, for the most part, people seem to love Botanik Natural Deodorant. Beneficial ingredients that do their job well, no toxic additives, no aluminum, and no GMOs. Good for you, good for the planet. All in all, Botanik Natural Deodorant looks like one of the best deodorants we have reviewed here. Great benefits, ingredients that do their job, not any serious disadvantages. Definitely one of the best natural deodorants available. If you want to try it out for yourself, you can grab a 2.5 ounce stick on Amazon for $12.99. For any and all other information, including the best natural deodorant, head on back to Green and Growing. Here are some top questions that I found for people seriously considering buying Botanik Natural Deodorant for Men. What ingredients are helpful for sweat control? Arrowroot Powder and Baking Soda both have great absorbency properties. Is this ok for sensitive skin? Botanik says it is, but to be safe it is best to check with your doctor before hand. Which ingredients are organic? The main 5 ingredients that are used in every Botanik deodorant product are USDA Certified Organic.